White paper on crime 2004 Part1/Chapter1/Section4/2. Table 1-1-4-9 shows the amount of stimulant and other drugs seized over the last15years.The amount of drugs seized seems the tip of the iceberg and does not coincide with the actual status,but is considered to show some trends in the demand for drugs. Seized stimulant drugs(powders)remained somewhere between80and700kg until1998,but rose sharply to1,994kg in1999and1,031kg in2000.Then they declined sharply to419kg in2001,and subsequently increased slightly to487kg in2003. Seized cannabis over the last15years peaked at995kg in2001,declined621kg in2002,but increased again to932kg in2003. Recently,seized synthetic narcotic tablets such as MDMA have increased to a record high of393,757tablets in2003,up from190,281in the previous year. 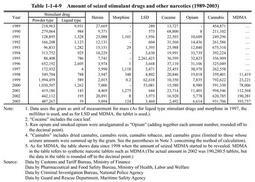 Table 1-1-4-10 shows embarking points of stimulant drugs found in large-scale seizures(seizure of one kilogram or more per a crime;including only those seized by the police)over the last15years.China since1993and North Korea since1997became major embarking points,and currently,these two countries and Hong Kong have been three major points of embarkation.In2003,the Philippines,Canada,and Malaysia emerged as new points. The Narcotics Provision Law entered into force in July1992.The Law established the regulations on punishment for illegal smuggling,etc.operated as businesses,punishment for money laundering ,and confiscation and collection of the corresponding value to be confiscated necessary for drug crime proceeds,and the realization of controlled delivery on an international level. Table 1-1-4-11 shows the number of Narcotics Provision Law violations cleared by the police since1994.The number stayed within the20-40range for some years from1996,but has increased to43in2002and44in2003. Table 1-1-4-12 shows confiscation and collection of the corresponding value to be confiscated in the ordinary first instance under The Narcotics Provision Law.The total amount of confiscation and collection exceeded¥100million in1997,reached a record of¥3,787million in2001,but declined to¥1,578million in2003.